Sailing with a topsail on a traditional gaff rigged sailing boat. Topsails make the most of what ever wind is availible, above the trees, when sailing on the Norfolk Broads. The topsail on a traditional gaff-rigged Norfolk Broads sailing yacht is used to add sail area to the existing sail plan with minimal extra weight. The advantages of a topsail are two-fold. 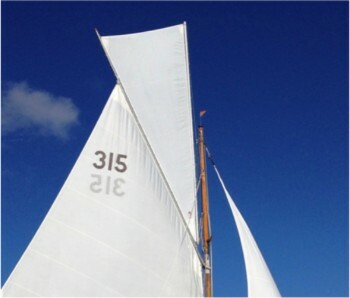 Firstly the additional sail is fitted above and towards the luff of the existing sail, making it more efficient by improving the overall sail shape (aspect ratio) and therefore moving the centre of effort towards the mast. This is particularly advantageous when sailing downwind, as it reduces the probability of broaching. Secondly the wind is cleaner and stronger the higher the sail. This is particularly advantageous on the Norfolk Broads where reed banks, trees and bushes can blanket the wind at lower levels. There are two types of topsail fitted to Norfolk Broads Sailing Boats; they can be either integral or rigged independently (separately) to the existing sails. This type of topsail is permanently rigged and is usually “designed in” by the sail-maker as part of the sail plan at manufacture. These topsails are always hoisted as part of the rig, together with the mainsail and permanently set, therefore cannot be easily de-rigged, if at all. They generally set well and provide excellent additional ‘drive’, both upwind and down. Bright Spark (illustrated below) is fitted with an integral topsail. As the name suggests this type of topsail is hoisted as-and-when required, and this is not necessarily an easy task. It is rigged once the mainsail has been hoisted. This necessitates the yacht holding a steady course on one tack whilst the topsail is hoisted and set. This type of topsail is usually an afterthought to the sail plan, and consequently requires additional rigging lines and spars, adding weight, windage and complexity. The additional sail area will definitely help performance downwind but may necessarily assist upwind due to the poor sail set, as in the example illustrated below. Please note that none of our boats are fitted with a separate Topsail.